Galleries chock full of drag racing photos, Grand American, IMSA and CART photos and vintage auto racing photos. Wow, let's see here...What you have before you are a number of galleries that include everything from AHRA & NHRA drag racing photos from the 70s; auto racing photos from today's Grand American series to 1980s CART and IMSA action; more drag racing series from Nostalgia events in the late 80s and the new millenium and finishing off with vintage auto racing photos from recent events. It's an understatement to say I enjoy auto racing. In fact, it is this appreciation that ultimately made me become a photographer. Included are some of the biggest names in motor sports. Andretti. Holbert. Fittipaldi. Garlits and Prudhomme. Shot from tracks as varied as Laguna Seca, long-defunct Fremont Drag Strip and the country club-like setting of Virginia Internat'l Raceway. All auto racing photographs offered for sale are scanned at high resolution and digitally printed to archival specs. See About Prints for more info. 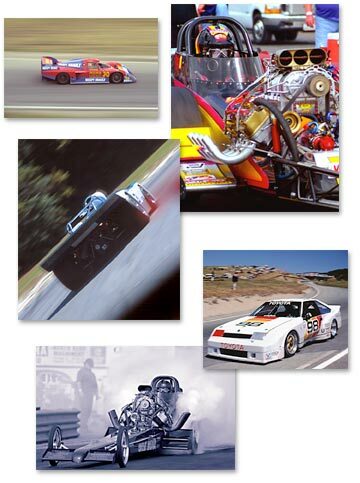 Greg also has a variety of concert and racing images available through his eBay store, Classic Noise. Galleries chock full of 1970s drag racing photos, nostalgia drag racing photos from the 80s and 90s, March Meet nostalgia drag racing photos from 2001 & 2002, Grand American, IMSA and CART photos and vintage auto racing photos. Also follow the link to Greg's eBay store, Classic Noise for a variety of motor sports and rock concert photos.